This rare and delicate flower is, for me, a milestone of spring. I watch for it every year at a certain spot along Middle River Road. It appears suddenly, overnight, between April 15 and 20, and lasts only a couple of days before shedding its enamel-like petals. Then the leaves, still clasping the stem at this stage, spring open to soak up the woodland sun for a few weeks before they shrivel and die again. The plant is bloodroot, so named because when cut at the roots, it bleeds red. Since it rarely grows in disturbed soil, I pray every year that no road crew will come along and dig in this spot. Bloodroot propagates in two ways. One is by spreading rhizomes underground, sometimes carpeting huge areas (not here, alas). Another is by dropping seedpods shaped like tiny canoe paddles. Ants consider these a great delicacy: they cart the pods into their nests, where they eat the fleshy part and discard the seeds. 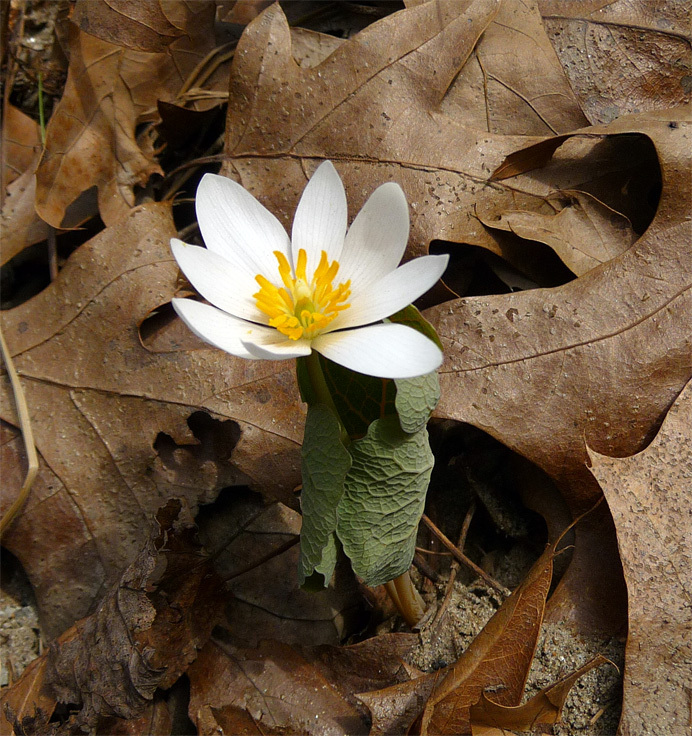 American Indians used bloodroot sap as a dye and an herbal remedy. Because it kills skin cells, it is sometimes prescribed by herbalists as a salve for warts, or even skin cancer. In fact, however, it can cause serious damage, leaving a large black scab and permanent scars. Products containing it are listed among the U.S. Food and Drug Administration's "125 Fake Cancer 'Cures' Consumers Should Avoid." Bloodroot is pollenated by tiny bees and flies. Coincidentally, today is the first day this year that I've been bothered by insects during my walk. I got a gnat in my eye on Kilian Drive, and twice later had to blow flies out of the space under my clip-on sunglasses. One of those happened moments after I took this picture. All of nature bows to the clock.